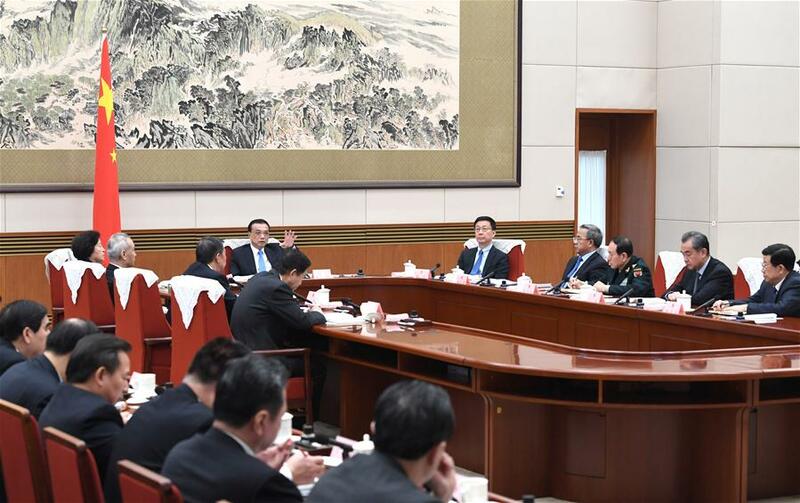 BEIJING, Jan. 14 (Xinhua) -- Chinese Premier Li Keqiang on Monday called for efforts to ensure economic growth within a reasonable range. He urged efforts to strike a balance among stabilizing growth, promoting reforms, restructuring, improving people's well-being and preventing risks. Efforts will be made to extend the country's advantage of having sufficient maneuver room for economic development, improve people's living standards, promote high-quality development, and lay a solid foundation for securing a victory in building a moderately prosperous society in all respects, Li said. He urged relevant authorities to better implement policies aimed at supporting enterprises and improving people's livelihood, stabilize and boost market confidence, and strive for a good start to the economy in the first quarter to create conditions favorable to achieving major economic and social development targets set for 2019. The country achieved its key economic and social targets in 2018, which Li said were "hard-won." The draft version of the government work report, which will be submitted for deliberation at the annual session of the National People's Congress in March, will be distributed to provincial governments and central government departments to solicit opinions, according to a decision made at the meeting.